How to Import and Edit iTunes Movie on Windows Movie Maker? I bought a full length movie in iTunes and I want to use bits of it in a school project but when I tried to insert it into Windows Movie Maker it did not work. I figured I had to somehow convert the format of the movie, but I am not sure how to do it. It is true that the movies purchased from iTunes store cannot be edited in Windows Movie Maker directly. The reason is that Apple Inc. encodes all iTunes videos, including movies, TV shows and music videos, with Fairplay DRM protection. In order to import and edit iTunes Movie in Windows Movie Maker, you may have to take shelter in DRM removal tool. NoteBurner M4V Converter Plus ( For Windows) is exactly what you need. The video file types supported in Windows Movie Maker are WMV, MOV, AVI, MP4, 3GP, 3G2, MPG, MPEG and so on. NoteBurner M4V Converter Plus is an iTunes DRM M4V Converter which removes DRM protection from iTunes movies first and then convert M4V videos to other video formats that are supported in Windows Movie Maker. It is worth mentioning that the program is not only a video converter but also a video editor. It allows users to create clips within the program. 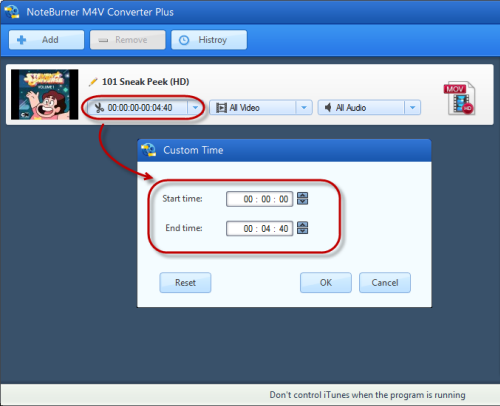 Step 1: Launch NoteBurner M4V Converter Plus and add the movie you purchased from iTunes store to the program. Click "Add" button and in the popup dialogue box, you can select the movies or TV shows you would like to clip. Step 2: Nevigate to where it says "Convert to" and choose a format in the output profile. All of the video types supported in Windows Moive Maker can be found in the list. In order to preserve the lossless video quality, "Same as source for mov" or "Same as source for mp4" is recommended. Step 3: Click the scissors icon and choose "Custom time" in the dropdown list. Input the start time and end time manually and click "OK" to confirm the changed settings. Step 4: Hit the big "Convert" button on the right panel to start conversion. When it finishes, the output folder will popup automatically. You can find the converted video file in mov or mp4 format there. Step 5: If you have skipped step 3, you can also import the converted video to Windows Movie Maker for further edit or add effects. Regardless of your experience in removing DVDs, you can use the DRM M4V Converter at the first sight. It is quite practical in converting iTunes M4V movies to Windows Move Maker. The feature of clipping video is also available in NoteBurner M4V Converter Plus. If you like to clip the iTunes video, why not have a try? How to Edit iTunes Video?